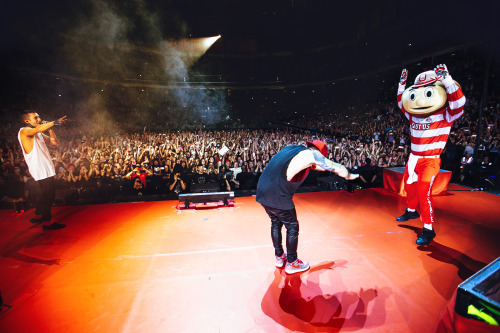 At least 15,000 fans crowded the Schottenstein Center on Friday, September 18, eagerly awaiting the moment Twenty One Pilots would take the stage. During the two hours that preceded, fans of varying genders and ages stood on tiptoe, donning ski masks, red and black eyeshadow, and shirts sporting the band’s logo, searching for even more merchandise available for purchase. There were two lines leading to separate tables displaying concert tees and other souvenirs, each so long that they eventually passed the other. People shuffled back and forth between their seats and the snack/beverage bar as opening band Finish Ticket played a few songs. They ended with a headbanger of a song before Echosmith, second opening act, performed multiple songs including popular tracks “Cool Kids” and “Bright”, which were accompanied in vocals by a majority of the audience. As enjoyable as these performances were, fans couldn’t help feeling anxious for fellow C-busers Tyler Joseph and Josh Dun to finally appear onstage. The practical hiatus between Echosmith wishing the audience a good night and the Pilots kicking off the setlist with “Heavydirtysoul” was almost unbearable. If ever the lights dimmed or an inbetween song ended, the crowd would go wild. This went on until finally, finally, the lights shut completely out. A man of many words, Joseph appeared in awe at the crowd that had seemingly memorized every word of his fast-paced, passionate songs. Breanna Henley, Whetstone High School sophomore and Twenty One Pilots fan, noted that many fans are so dedicated to the band due to Joseph’s relatable lyrics. The singer has struggled with depression and self-doubt, and his songs have conveyed to fans struggling with similar issues that they are not alone. Favorites such as “Tear In My Heart” and “Holding On To You” had fans on their feet and dancing about, while more intimate songs like “The Judge” had them swaying and singing along. Still, the best was yet to come. At one point during the concert, the people in the pit found themselves supporting a still singing Tyler Joseph by gripping his feet as he continued to perform. However, spirited drummer Josh Dun topped this by drumming- yes, drumming– atop the crowd on a platform held by the hands of fans. At the plea of an encore, the two returned to the stage after bidding farewell to perform not only “Car Radio”, but, the favorite of many, “Trees”. This personal song, both fast-paced and weighted, was the perfect ending to an unforgettable night. Twenty One Pilots is arguably even better live. Posted on October 20, 2015 October 21, 2015 by silaslandPosted in CommunityTagged community.